For decades, our lawmakers have put off much-needed infrastructure repairs and construction that put so many of our members to work. It doesn’t matter where the bridge, road, electrical grid or water project is located–corrosion happens. It threatens the continuous operation of services that are essential to our daily lives and corrosion threatens public safety. IUPAT members visited the halls of Congress Wednesday, April 10, 2019, to urge their representatives to introduce and pass a trillion dollar infrastructure bill with anti-corrosion language. Our activists asked their representatives to sign onto this letter being circulated by Congressmen Dan Lipinski (D-IL) and Michael Bost (R-IL) calling for consideration of anti-corrosion efforts in any new Infrastructure bill. Make Your Voice Heard: Call your Representative at (202) 224-3121 and ask them to sign on to the Bost-Lipinski Letter. 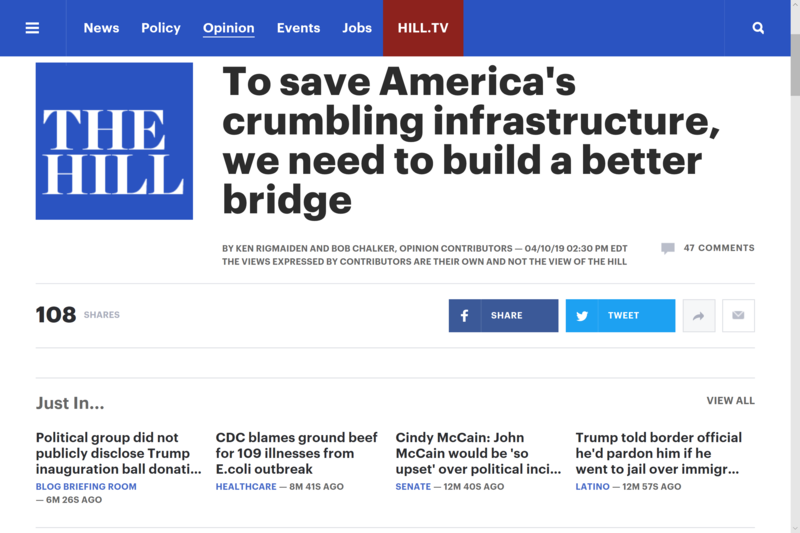 Read my joint opinion piece with NACE CEO Bob Chalker featured in The Hill that outlines why Congress must not only fund infrastructure, but require that projects are done right and fiscally responsibly by mandating anti-corrosion measures performed by certified specialists. The truth is that a poorly executed corrosion prevention effort is as good as doing nothing. It’s taxpayer dollars down the drain. Read + share on social media! 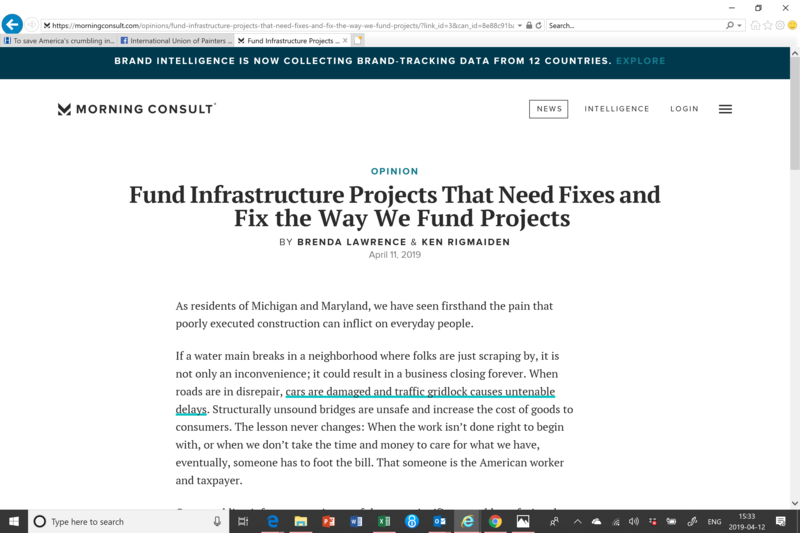 We also teamed up with Representative Brenda L. Lawrence (D-MI, 14th District) to pen this opinion piece for Morning Consult. The IUPAT Infrastructure Website is now live! ICYMI: Please check out our new Infrastructure Toolkit for your district council to use to on social media, including our brand new video and infrastructure website. 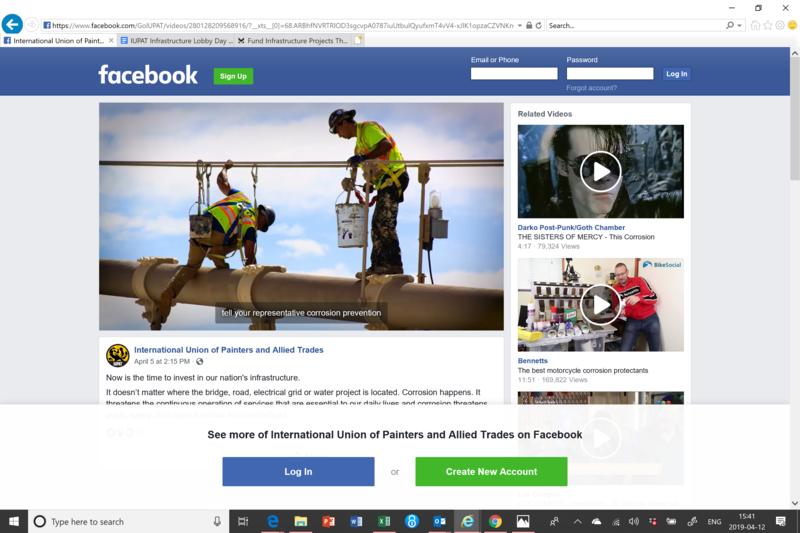 Please use these links and text on your social media platforms with the hashtags #InfrastructureNow #CostOfInaction and #UnitedWeBuild to promote the IUPAT message! Thanks for your support as we strive ever harder to advance the interests of IUPAT members and all working people across North America.